A few weeks ago, Carla and I had the most delicious bread at Artisanal in NYC. We originally went to Artisanal on the basis of its fame as a cheese shop, but with the intentions to share a cheese plate at their in-house restaurant. It was also a lot of fun to just look through their cheese cave, where cheeses are set to further age upon being imported to the U.S. The cheese plate we shared featured Piper's Pyramid, from the Indiana-based goat cheese company Capriole. It's basically a soft ripened goat cheese, shaped like a valencay (pyramid with the top cut off), and dusted with chili pepper on the "peak." Tart in flavor, with a lemony and grassy finish, this was one of my favorites on the board . The next was a rather mild robiola, a creamy and mild cheese from Italy with a fuzzy white rind of mold like brie. It was much milder than other robiola's I've had, but still very pleasant. A treat for myself was trying one of Rolf Beeler's zesty Swiss cheeses. His mountain cheeses are similar to appenzeller or gruyere, but with an intense flavor. They're hard to find, as their small production and high demand prices them out of most markets. Lastly we ordered Serra da Estrella, from Portugal, but they had run out, so we subbed with the similar Torta del Caesar from Spain. This cheese looks like a giant cake("torta") but once cut into, you find a runny, salty, and zesty cheese inside. Delicious with dried fig cake! 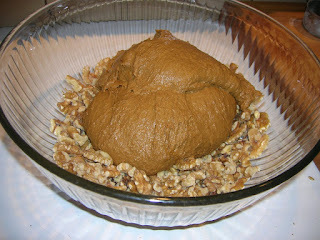 So if you're wondering why the title to this post is "Walnut Bread Clone Recipe," wonder no further. 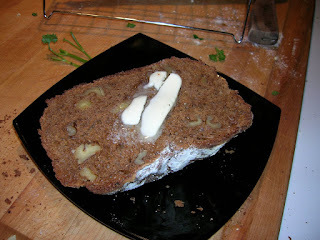 After all that cheese, Carla and I just fell in love with their dark walnut bread. It was generously studded with whole walnut halves and delightfully chewy in texture. I've been working on recreating it, darkening the bread with molasses and wheat flour, but not replicating the odd, brown/purple color of the bread. What I did create had all the walnut goodness, but it was a bit denser and needed a dash more salt. Still, it was delicious warm from the oven with a slathering of butter on top. All I could do was a savor a slice and think about what to do differently next time. Now that's the kind of problem you want to have!